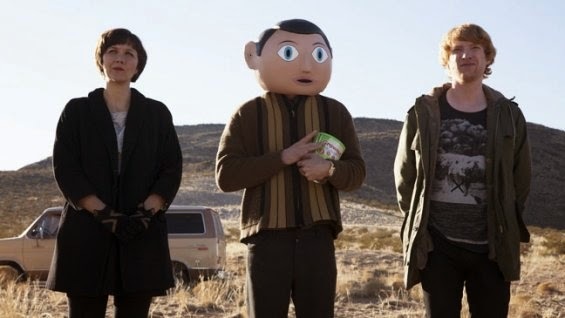 Frank is a movie of extravagant beauty and intricate sadness. A sentimental tune, a human fable of creativity and destruction - it is a film which is experienced, lived in for 94 minutes, rather than simply watched. Loosely inspired by Jon Ronson's time as Frank Sidebottom's keyboard player, the story arc takes place inside a head we don't get to see - concealed by an oversized papier mache mask and woozy dreams of creating music of enchanting exquisiteness, chances to peer into the mind of the title character are few and far between. Jon (Domhall Gleeson) finds himself a member of the Soronprfbs almost by accident and, upon introduction to the group's charismatic frontman, believes himself to be in the presence of a genius of sorts. Frank (Michael Fassbender), a commanding figure, spends his days pursuing the creation of perfect, transcendental music. He pushes himself, and his band of disciples, as far as physically, emotionally and spiritually possible in his pursuit - but at what cost? As Icarus aspires to the sun, what will Frank's impossible dreams cost him and those close to him? Lenny Abrahamson's dark and brooding feature flits between tones to winning effect. We experience the euphoria of the highs - the jubilation which flows from the energy of the band connecting metaphysically during performances, rapturous alchemy spilling from their instruments. Yet, it is the impossible, bittersweet lows which truly stick with the viewer like the world's most painful, and painfully catchy, tune. Fassbender, as Frank, breaks before our eyes like a shattered vinyl record - the shards of what once appeared the perfect whole fragmented into unsalvable scraps. It is an unflinching performance in an unflinching, uncomfortable movie which calls to mind The Devil and Daniel Johnston on numerous occasions. A perfectly chiseled movie about mental illness and the madness of dreams and passions pushed too far, Abrahamson's eerie, intense and striking Frank is one of the most unforgettable films of the year.